Is CA ranked 47th or 25th? The Census Bureau report strongly refutes the oft-cited “fact” that California is near the bottom in per-pupil school spending. The national average was $9,138 in 2005-06. California was at $8,486, with New York the highest at $14,884 and Utah the lowest at $5,437 – one of 22 states, in fact, that fell below California’s level. In terms of school revenues, California was 25th among the states at $10,264 per pupil, just under the national average. It was above average in per-pupil income from federal and state sources and about $1,700 per pupil below average in local revenues, thanks to Proposition 13, the 1978 property tax limit measure. Why are the rankings so different? Education Week adjusts per-pupil spending to reflect regional variations in cost of living, particularly teacher salaries, and the National Education Association does not. Both start with similar spending in California during fiscal 2004-05. Education Week uses federal data, $7,905 per pupil; the NEA uses its own data, $7,942 per pupil. Then Education Week applies a 1990 federal “geographic cost of education index” that drops California from 30th to 46th at $7,081 per pupil, well below the national average of $8,973 per pupil. Spending more than $12,000 per pupil in Education Week‘s ranking are New York, New Jersey, Vermont and the District of Columbia. 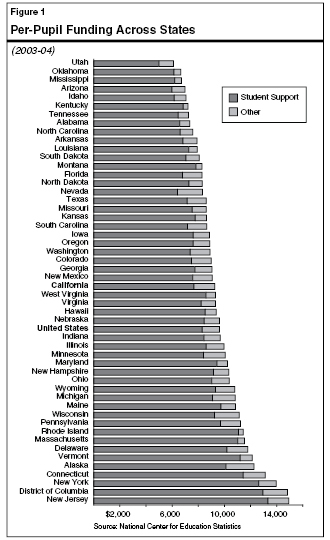 Below California are Idaho, Arizona and, at the bottom, Utah at $5,463 per pupil. The nation’s public school districts spent an average of $8,701 per student on elementary and secondary education in fiscal year 2005, up 5 percent from $8,287 the previous year, the U.S. Census Bureau reported today. New York spent $14,119 per student — the highest amount among states and state equivalents. Just behind was neighboring New Jersey at $13,800, the District of Columbia at $12,979, Vermont ($11,835) and Connecticut ($11,572). Seven of the top 10 with the highest per pupil expenditures were in the Northeast. Utah spent the least per student ($5,257), followed by Arizona ($6,261), Idaho ($6,283), Mississippi ($6,575) and Oklahoma ($6,613). All 10 of the states with the lowest spending per student were in the West or South.